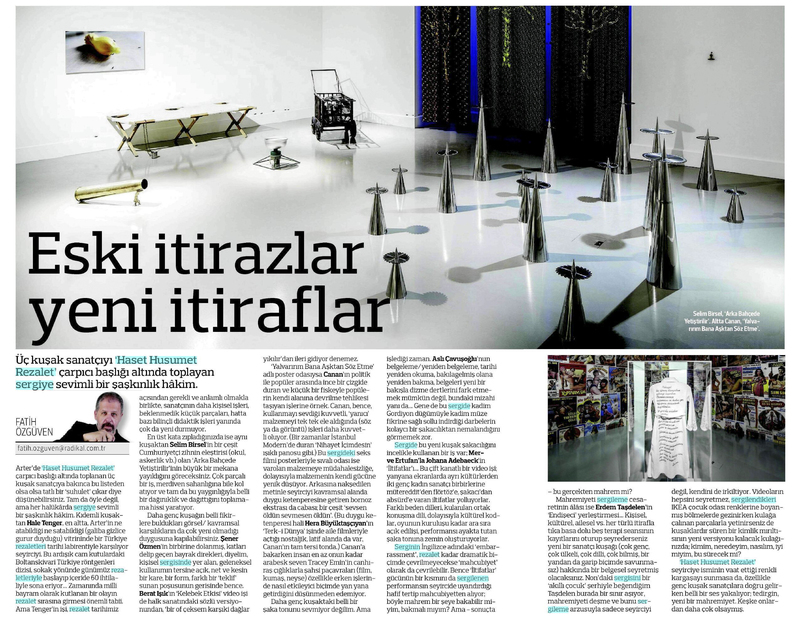 An article on the “generational divide in some of the exhibitions that are on view in Istanbul at the moment” in ArtAsiaPacific. 1/03 – 22/03/2013, we are participating in the exhibition Ward Robe in Spare Oom at Gallery 1:10 (at Galleri Verkligheten) (Umeå/Sweden). A review on the Envy, Enmity, Embarrassment, by Fatih Özgüven (published on 03/02/2013 on Radikal). A review of Envy, Enmity and Embarrassment on SANATATAK. 24/01 – 07/04/2013, we are participating at Envy, Enmity, Embarrassment in Arter, Space for Art (Istanbul/Turkey). 07/08 – 21/08/2011, we are participating at I Am Not A Poet. 2 weeks festival by Totalkunst Gallery and VerySmallKitchen. They will be screening Repeaters on the 17th-19th of August. 31/03/2010 takes the structural investigation on our interaction on another level with the use of psychoactive drug: alcohol. Alcohol plays a significant role in many social interactions; and due to its neurological effects lifts many personal restrains, allowing certain innate patterns to disclose. It starts out as an experiment, and manages to highlight an intense power struggle between the two of us. Please contact us to view the video.